In a world where almost anything can be found online, why are we still forced to pay hundreds if not thousands of dollars at the campus bookstore each semester? Depending on the class, you might not even end up using them for anything but an expensive paperweight, yet you're still expected to shell out the money to carry them around with you and ruin your back. If you've ever had that moment of thinking, "There's got to be a better way!" like on an infomercial, then you're in luck, because there absolutely is. Ditch the heavy textbooks and just download the Campus Books app. 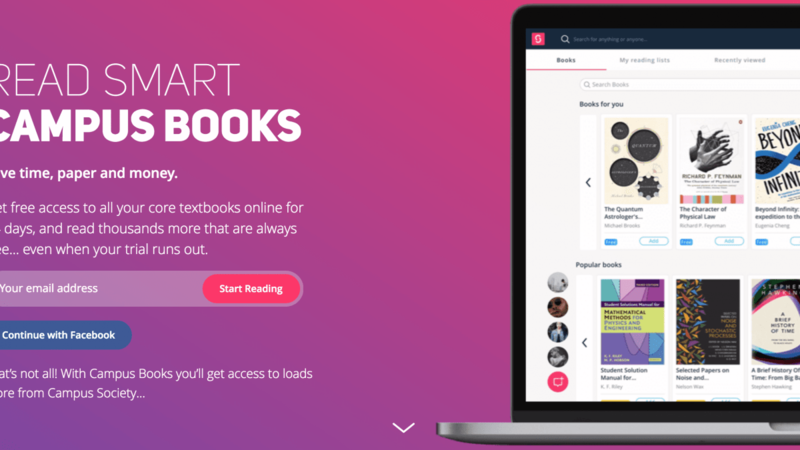 With Campus Books, every textbook you'll need is at your fingertips, accessible through both Android and iOS devices, as well as desktop. Tons of books are available to read entirely for free, with others available for an annual membership fee of £5.19 per month in 12 month periods per book, plus a 14 day free trial on one book for all new members. Any way you slice it, it comes out cheaper than buying or renting from your campus bookstore. But this app is more than just textbooks. By making an account entirely for free, users can chat with each other, find their classmates, look for things to do around school, and track their GPA all from the app. It can even help you track down the books you'll need by inputting your major and school, making learning a breeze even before classes officially start. Coming soon, you'll even be able to use the app to find internships, jobs, and graduate study opportunities. Using the information on a person's profile, the Campus app can filter things based on what a student is looking for and help to match them with the right jobs for their needs and goals, eliminating one of the most stressful parts of going to college. This only scratches the surface of just how helpful the Campus Books app can be for the busy student. Making an account is entirely free, so check it out today and see just how easy learning really is.